Sharing files continues to be much harder than it should be. Whether you’re trying to show someone a screenshot, send them some text, or send a file quickly, there are a thousand decent options but no good ones. I’ve been using Droplr for a couple of months now, and I am quite pleased with it. 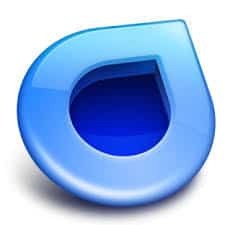 The overall concept is that you perform some sort of operation on your computer, and Droplr’s client on your system transparently creates an internet link for what you did. 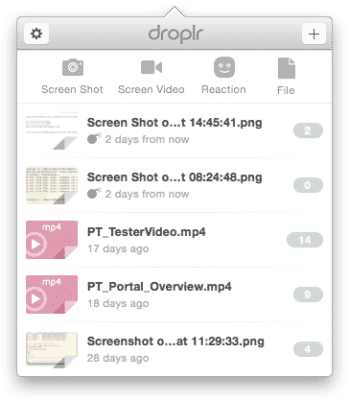 So, if you took a screenshot with Droplr then the link (automatically copied into your clipboard, by the way) is of that screenshot. 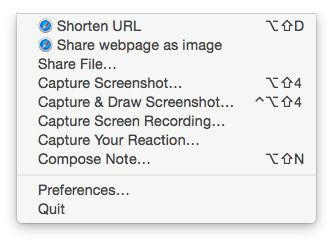 If you captured a file using Droplr then the link now points to that file (again, automatically). So you basically do something and then paste a link to whoever using chat or email. They then click that link and instantly receive whatever you sent. Plus, it’s integrated within OS X through a transparent menu bar extension, and it has great shortcuts. Plus you can set expiration on files and can use a custom domain for the links you send. Overall I’m just really happy with it, and if you have the issues listed above I’d recommend you check it out. Thanks to my friend Tom for turning me on to the service.